Bumsuk Choi and his General Idea label were amongst the first of a new wave of designers from South Korea to gain praise on the international fashion circuit. And, in his case, the success really is one based on talent and hard work. Growing up without the privilege of access to a formal design training, autodidact Bumsuk Choi, is one of those old-fashioned stories of the University of Life. He worked his way up within the industry, starting out selling textiles in the traditional rag trade district of Seoul and learning his skills through observation and practice. In 2003 he launched his luxury menswear label General Idea that went from strength to strength, primarily in the growing Asian youth markets. In contrast to some of the hot young Korean talents who have gained a growing reputation for their innovative womenswear in the West, Bumsuk Choi’s process was one of consolidating in Asia before looking further afield. More recently, for example, he has shown his collection at New York’s Fashion Week, he first Korean menswear designer to do so. If General Idea’s recognition in the West has taken a little longer than for some of his compatriots, that’s hardly the case in Asia. His particular take on menswear, with a punkish street-style heritage to it has proved a hit with the trend-hungry Asian kids, a popularity with which international brand Puma have been more than happy to be associated. Following closing a deal with Puma last year to design for the Puma Archive, this September, sees a capsule collection for Puma by General Idea hit outlets all over Asia. It includes a design for the Disc Blaze classics as well as some hoodies covered in scrawled text motifs. 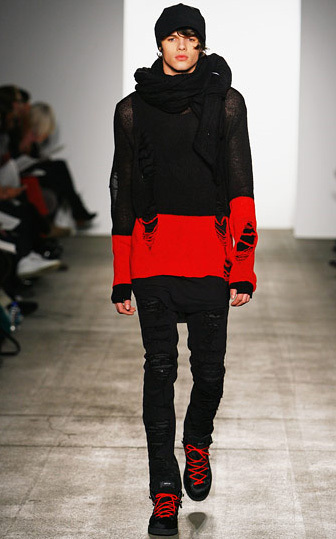 At about the same time, General Idea’s own collection is offering an experience that seems to be something of an homage to whole series of male streetwear traditions, from the frayed jumpers and skinny jeans silhouette of punk through to the shorts-over-leggings and knitted cap nonchalance of Seattle grunge. There’s even a bit of a futuristic feel reminiscent of A Clockwork Orange at times. Jacket options are drawn from everything from classic pilots jackets to the duffel coat. Pulled together in a overall palette of black, charcoal and grey, fire engine red, electric blue and the occasional white subtle textile motif provide the accents.